SPRINGFIELD – The Clark County Department of Job and Family Services is hosting several events this month as part of national Child Abuse Prevention Month. The Board of Clark County Commissioners read a proclamation supporting the fight against child abuse at its April 4 meeting. Clark County saw 4,107 child abuse referrals in in 2017, an average of more than 11 per day. On April 11, the Children’s Services division is asking local workers to wear blue to work in support of child abuse prevention. DJFS is also hosting its annual Blue Ribbon Tree contest. 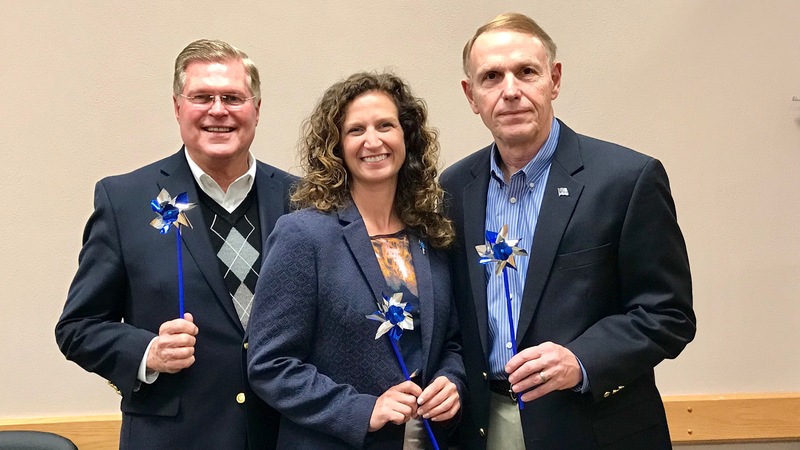 The blue ribbon is the international sign for child abuse prevention and serves as a constant reminder that all of us have a responsibility in helping to protect children. Photos of the Blue Ribbon Trees will be displayed on the DJFS website beginning April 11 and judging will be held later in the month. On April 23, the division is asking local workers to wear ugly ties to work in support of child abuse prevention. For more information, log on to www.TieOne.org. First Responders and Bikers Advocating against Abuse are hosting its annual Shoe Drive this month. Residents are asked to donate new or gently used shoes of all sizes to support local children and families in needs. Drop-off locations include the lobbies at all Department of Job and Family Services buildings and the lobby at Springfield Regional Medical Center. Residents may also take Pinwheel selfies this month to support the fight against child abuse. The pinwheel is the national symbol for Child Abuse Prevention. The division is seeking photos from all of these events to post on its social media page. To submit photos, e-mail Deborah.Estep@jfs.ohio.gov. For more information, call 937-327-1790.